As I was wrapping up my last night of shooting at the Sheep Barn I noticed the setting moon shining through the bare branches of this oak tree. It was sort of an afterthought to stop and try and get this photo; plus the moon wouldn't hide completely behind the bigger oak limbs causing a little bit of lens flare, but I thought it came out nice anyway. Another barn, another night (or nights). This is the Sheep Barn. Originally, it was part of the ranch back when Mary Bowcher was the owner. My dad remembers shearing sheep in this barn in the '50s when his dad, my grandpa, worked as Ms. Bowcher's ranch manager. Today it belongs to the Luchetti family, who purchased it from my grandpa not long after Ms. Bowcher died and passed the ranch on to our family. We were very lucky to have inherited the ranch from Ms. Bowcher, though with the imposition of a hefty inheritance tax, Grandpa was forced to sell off a significant piece of land to pay the tax. So in 1969, we sold over 600 acres (which included the Sheep Barn, a hay barn, an old victorian house, and other structures) to the Luchettis. It was unfortunate to lose such a big piece of the original ranch, but in doing so we were able to keep the remainder (1,700 acres, two other barns, and our house) in our family. And in hindsight, we couldn't have sold to a better family. Like us, the Luchettis want to keep the land as close to its original state as is reasonably possible. Our mutual goal is preservation. Plus they're just really good people. 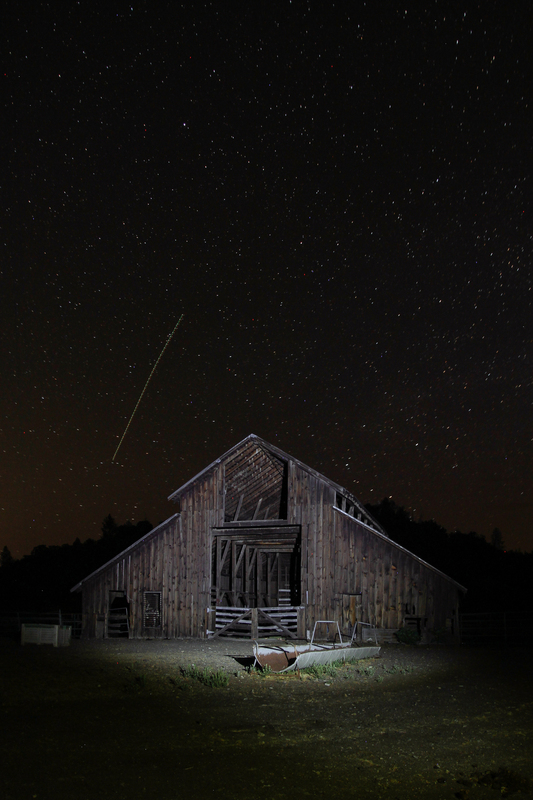 Beginning with the old barn that I photographed last summer, I have been on a quest to take night photos of all four of the original Coyote Valley Ranch barns. The Luchettis gave me permission to photograph the Sheep Barn at my leisure, which I did on three different nights over a span of about six weeks. While all three photos are of the same subject I think each one is unique, especially the first two, as the differing degrees of light and darkness change the feel of the image. On the third and final night of shooting the Sheep Barn I wanted to focus less on the general profile of the barn and more on capturing smaller structural details. I tried to use light (both natural and artificial) in varying ways to accentuate those details. Since photography is all about the capture of light, it goes without saying that different lightscapes offer differing impressions of a single subject. Such is the case with the old barn. I'd photographed it previously at night, once in winter under a full moon, and more recently in the pitch black of a hot summer night. I took these photos just the other night under a very bright half moon on a night when a cool breeze was moving in through the barn from the West. The light of the moon made everything in the images sharper, it created shadows, and illuminated spaces that would have otherwise just been black. So while the photos are all similar to their counterparts in the previous post, I thought they were different enough to put up here.